Fairfax, VA is a Northern Virginia community that offers a wide range of attractions, events, and things to do. From the monuments and parks to the theatres and ornamental gardens, each moment of your stay is sure to be filled with fun activities. Here are just a few of the top sights and entertainment options you’ll want to check out. 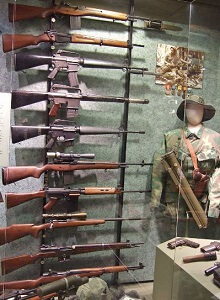 The National Firearms Museum in Fairfax, Virginia houses more than 3,000 firearms across 15 galleries and 85 exhibits. The 15,000 square foot facility is where patrons can go to get a close-up look at the nearly 700-year history of firearms and how they were used in American history. Within the galleries you’ll also find life-sized dioramas that include a trench on the Western Front in WWI and a 19th century riflemaker’s shop. The Museum is self-guided with docents and pamphlets providing additional information. The Fairfax Symphony Orchestra has transformed into one of the finest regional orchestras in the United States. Throughout the year the Orchestra puts on magnificent concerts that delight that senses and expands the mind. The Orchestra is conducted by music director Christopher Zimmerman who has been with the Orchestra since 2009. Check out the FSO’s list of upcoming concerts and get your tickets today. Ox Hill Battlefield Park is the very site of the Battle of Ox Hill. This is the only major battle fought in Fairfax County. More than 1,500 soldiers were wounded or killed during the battle, which took place on the afternoon of September 1, 1862. The Park marks the significance of this battle that occurred during the Civil War and a pair of granite memorials honor the Union generals killed on the land. Formally known as the Patriot Center, Eaglebank Arena is a 10,000-seat arena located on the campus of Northern Virginia’s George Mason University. Throughout the year, the arena hosts sports games, family shows, concerts, and commencement ceremonies, many which are open to the general public. Grab your tickets and come to watch live entertainment. Fair Oaks Mall is the premier shopping destination in the Fairfax area. The mall features more than 200 specialty stores, as well as many service facilities, retail outlets, and restaurants. The two-story retail center also offers a play area, frequent shopper program, and mega stores like JCPenny, Lord & Taylor, Banana Republic, and Pottery Barn. Fair Oaks Mall is open seven days a week. Fairfax Ice Arena is an indoor ice rank offering adult hockey and figure skating all year long. The rink also offers public skates, as well as lessons and classes. Prices are inexpensive, making it a fun outing for families on a budget. Fairfax Ice Arena is also available for parties and groups. Looking for fun and exciting things to do in Fairfax, Virginia? The buzzing community offers plenty of events, sights, and activities to keep you busy.